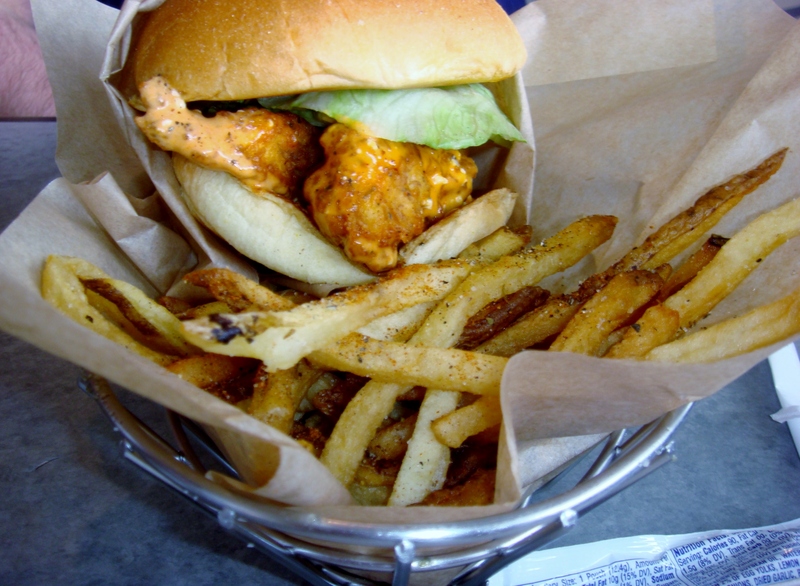 Tenders is a popular fast-ish food joint in Cornelius, NC. It is a on the corner of the beaten path, but you still have to know what you are looking for. Hint: Follow the crowds, because this place is always jacked. The food here is very fresh, and all of the ingredients are homemade. 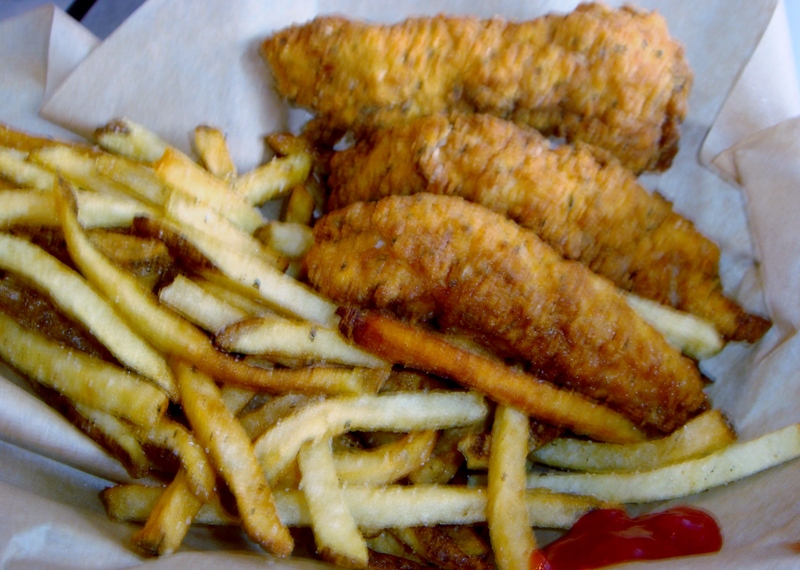 Hand-breaded chicken tenders, not frozen and fried. The fries are hand-cut and fried, not frozen. In fact, they have NO freezers at all on premises. The sauces are not processed bottled sauces, they whip them all up on site. It’s a huge change from chains and you can taste the difference. Another thing I love about this restaurant is that it is dine in, carry out or drive up. Sometimes you just don’t want to get out of your car, you know? OK, so by the name of the restaurant, you know you are getting some chicken fingers. And you won’t be unhappy. That’s what they do, and they do it well. The chicken fingers are nuclear hot when they are delivered to you, and you get to choose your own sauce from about 8 homemade varieties. You know I chose Ranch. Delish! Back in the day, you used to get recipe cards with your bank statements! At least at the little bank we used in our town of Crestview, Florida. First Bank of Crestview still sends them out to this day! Most of us get our statements online to save a tree, I guess, but lucky for me, my mom-in-law gets them in the mail and still saves the recipes for me! This recipe is from one of these old timey cards. Now, I’m going to give it to you like it was written. But. I am making a couple of changes next time I make it. My people loved it just this way, but I like my chicken a little more tender. So, next time I’ll either sear it in a pan first or just bake it a bit longer, maybe an hour and half. I’m crazy like that. 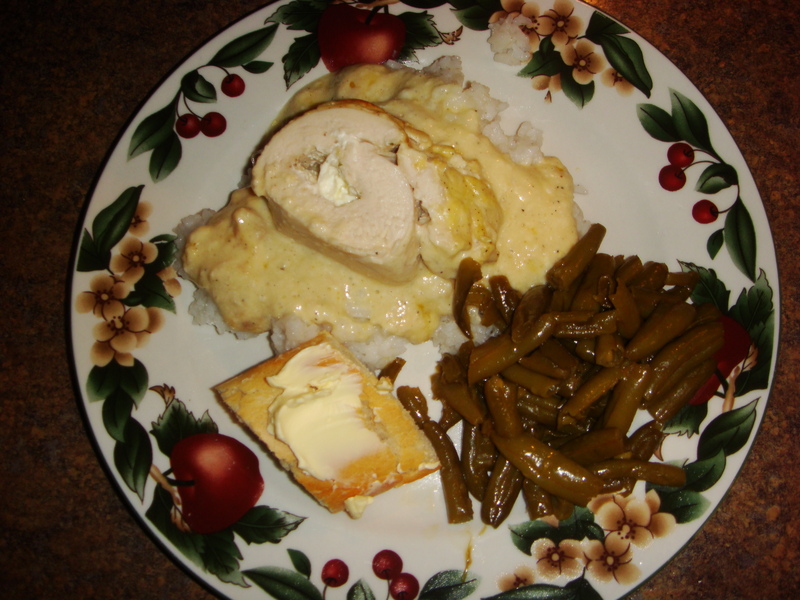 Specialty Chicken over rice, green beans and bread with butter. Yums! Pound chicken breasts until flat. Sprinkle each breast with 1 teaspoons parsley flakes and garlic powder. Add one slice cream cheese and roll up chicken, securing with toothpicks. Place breasts in a greased 13×9″ glass baking pan. Combine remaining ingredients until smooth and pour over chicken. Bake at 325 for one hour. Serve over rice or egg noodles. 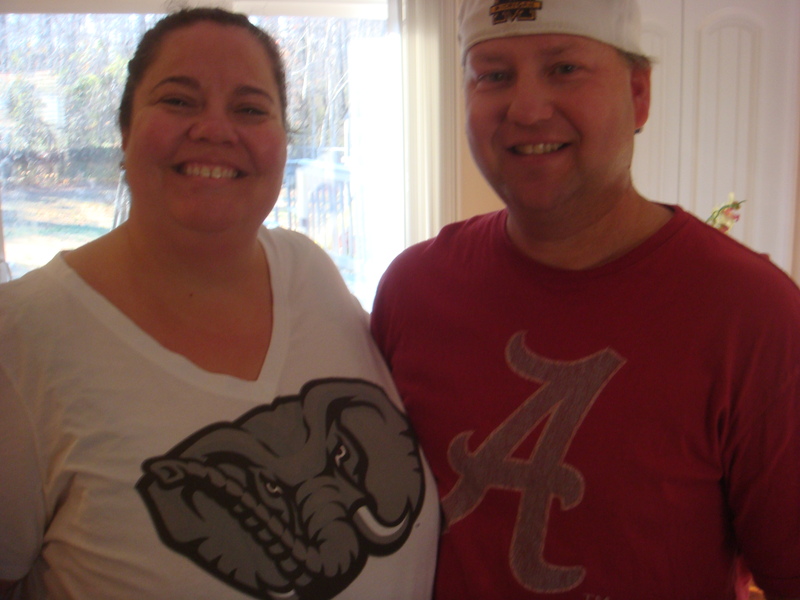 Roll Tide, ya’ll! College Football has returned, thank heavens! What do we do with ourselves the other 8 ish months of the year? While college football is severely cutting into my foodie restaurant reviewing experiences, it does give me a chance to do something I love equally well: Test out new recipes on hungry fans. Each Bama game day I make a bunch of snacky foods for us to grub while we watch the Tide roll. Last weekend was my first trial run. I learned a lot about the day. First, think about the appliances you have in your home for cooking. 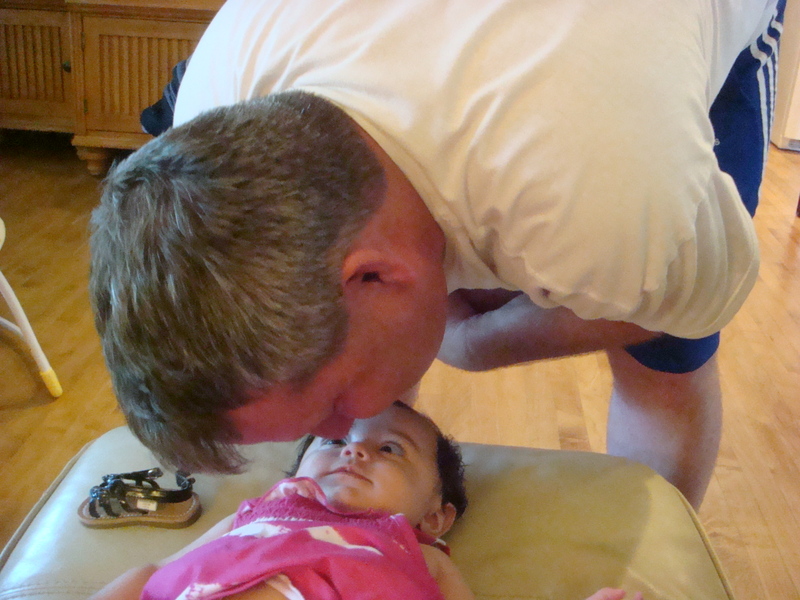 Make sure you only have one oven food, one stovetop food, one crockpot food…you see where I’m going here? I scheduled myself too tightly on stove/oven duty and ended up missing the first quarter due to poor planning. Never again. For chicken: In a small bowl, combine cumin, salt, pepper and cayenne. Rub chicken breasts with spice mixture. Grill chicken 6 minutes on each side or until tender. Remove from heat and thinly slice; set aside. For sautéed mushrooms: Heat butter in a sauté pan over medium heat. Add sliced mushrooms and onions. Season to taste with salt and pepper. Cook until mushrooms are soft. Remove from heat and set aside. For basil sour cream: Combine basil, garlic, salt and pepper in a food processor. Process until pureed. Mix into sour cream. Set aside. To assemble quesadillas: Pre-heat grill or griddle to 375 degrees Fahrenheit. Place tortillas on a flat surface. Generously sprinkle cheese onto one half of each tortilla. 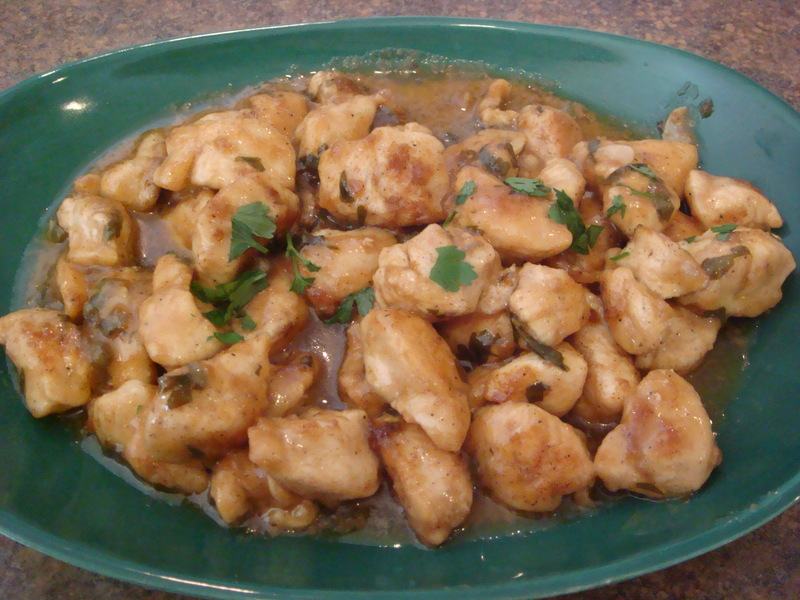 Combine chicken and mushrooms; divide evenly on top of the cheese. Sprinkle cheese on top of the chicken and mushroom mixture. Season to taste with salt and pepper. Fold each tortilla in half (creating a half circle shaped quesadilla). 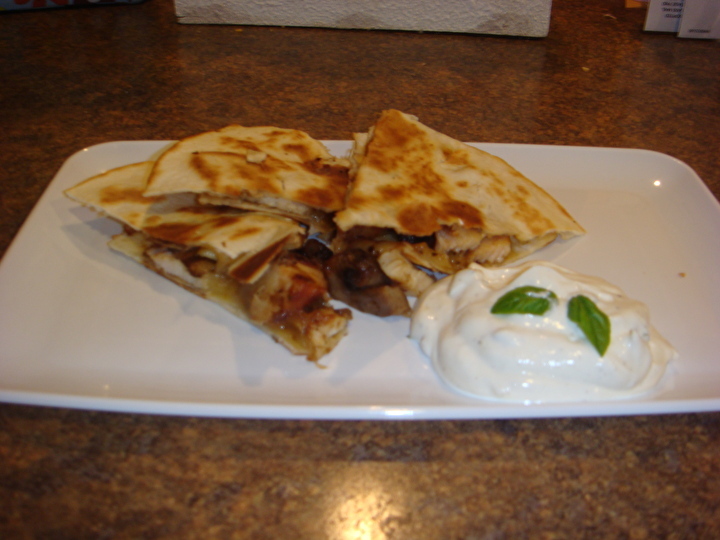 Cook each quesadilla about 4-6 minutes, until cheese is melted and the tortilla begins to brown and crisp. Flip tortilla and repeat about 4-6 minutes. Remove quesadilla from heat and cool about 30 seconds before cutting into 3 triangle slices. Serve with basil sour cream. 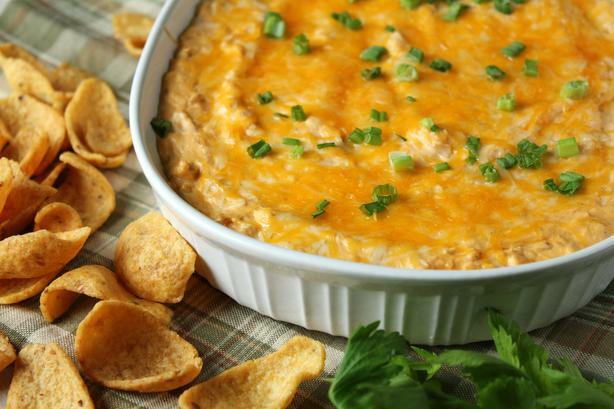 This dip is sweet with just the right amount of peanut butter to give it depth. We gobbled it right up! 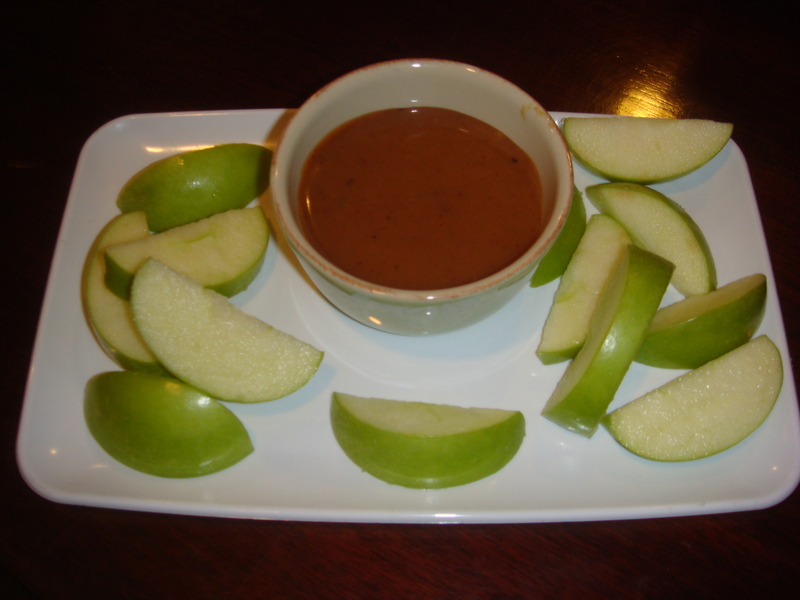 Combine all ingredients except apple slices in a saucepan, stir until smooth, and heat until scalding, watching to make sure it does not stick to the bottom of the pan. Transfer dip to slow cooker, if needed, cook on low for 20 minutes. If not transferring, simmer on stovetop for 5-10 minutes. While the dip is warming, slice the apples and place on a serving plate. Serve the dip from the cooker, while turned on low to keep it creamy, or from bowls. This recipe has been allllll over the internet, but there’s a good reason for that. It is simply delicious. And, if you are having a football party, you have to include some form of Buffalo Wings, right? Beat cream cheese, ranch dressing, and red hot sauce. Spread mixture into pie plate sprayed with Pam. Bake at 350 degrees Fahrenheit for 15 minutes. Bake an additional 10 to 15 minutes. Serve hot with Frito scoops. And you know you can always do make aheads and put them in the fridge! This is officially a sandwich, yes. But cut in in smaller pieces and bang! you have an appetizer. These are so darned good. Spread mayonnaise on one slice and pizza or spaghetti sauce on the other slice. Lay pepperoni slices on the pizza sauce and the cheese over the top of that. Sprinkle Parmesan on the mayonnaise slice. 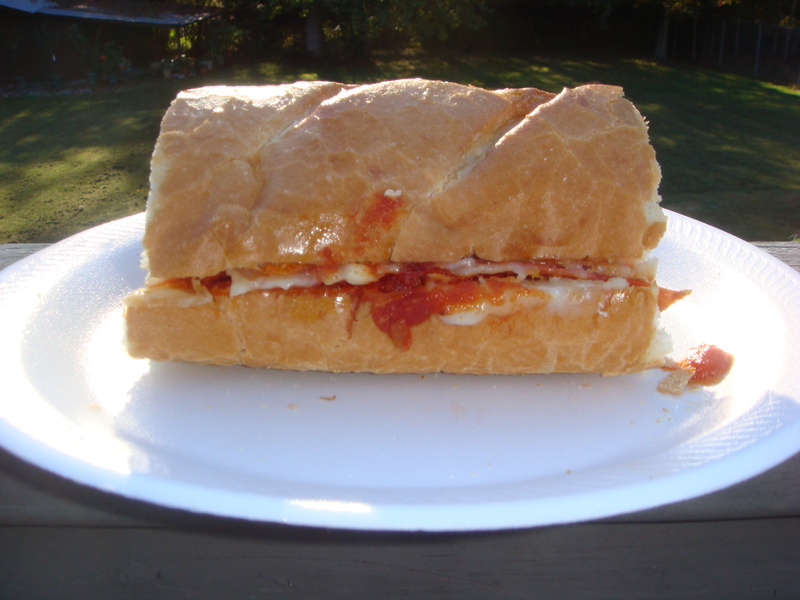 Pop both pieces into the toaster oven (or put together and use a panini maker) until cheese is bubbly and melted. Fold sides together, and serve while warm. VARIATION: try this with your favorite pizza toppings OR cheeses. SERVING SUGGESTION: Cut on point into four pieces and use as “appetizers” or little kid-wiches. Easy to put together on a busy weeknight, with plenty of passive cooking time. A new staple for us! The rice does get pretty “soggy” so if you are someone who likes individual grains of rice, this is NOT the recipe for you. Combine soups, butter, water and rice in buttered oblong casserole dish. Salt and pepper chicken and place in mixture. Bake at 350 degrees for 1 1/2 hours. I love love love a good salad. “A big salad? With lots of stuff in it?” Yeah, I also lovelovelove Seinfeld. Anywho, I found this recipe online by Kelsey Nixon. I used the exact recipe, and made the dressing…but I HATED the dressing. Sorry Kelse! Anyway, I’m not including it here, so use your favorite dressing. I prefer homemade Ranch, but I bet Bleu Cheese would be good, as well. Rinse and dry all the salad greens, and toss them together in a large bowl. 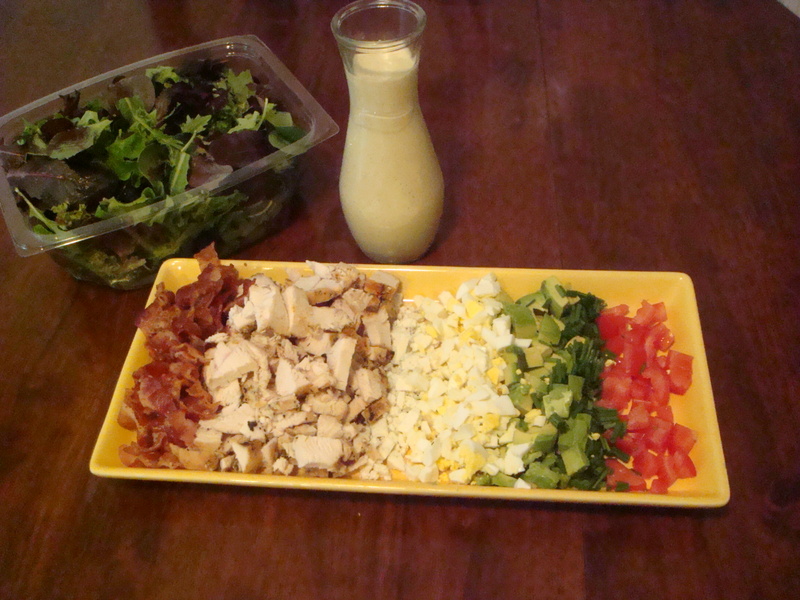 Arrange the chicken, bacon, avocado, tomato, and Roquefort in uniform rows on top the mixed greens. Garnish with the grated hard-boiled egg, and chives. Just before serving, pour the dressing over the salad and toss. Combine flour, garlic, salt, pepper, and paprika in a plastic grocery (or large ziplock) bag. Add chicken and shake to coat well. Set aside. Heat butter and olive oil in a large skillet over med-high heat. Shake excess flour from chicken pieces and place in skillet and saute for about 5 minutes, until golden brown. Do not overcook. Remove chicken from pan, and set aside, covered to keep warm. Remove all but 2 Tbsp of fat, retaining browned bits of breading. Stir wine and broth into pan drippings, deglazing the pan. Add lemon juice, capers, and parsley. Return chicken to skillet, tossing to coat. Reduce heat to medium, and continue cooking until sauce thickens slightly and chicken is cooked thru. Serve immediately with fresh lemon wedges.